Today in music videos: The Shins take a sinister turn in "The Rifle's Spiral"
James Mercer’s main project The Shins has a darker aura to its sound on Port Of Morrow, and now one of the album’s most straightforward rock songs has a video to match that atmosphere. 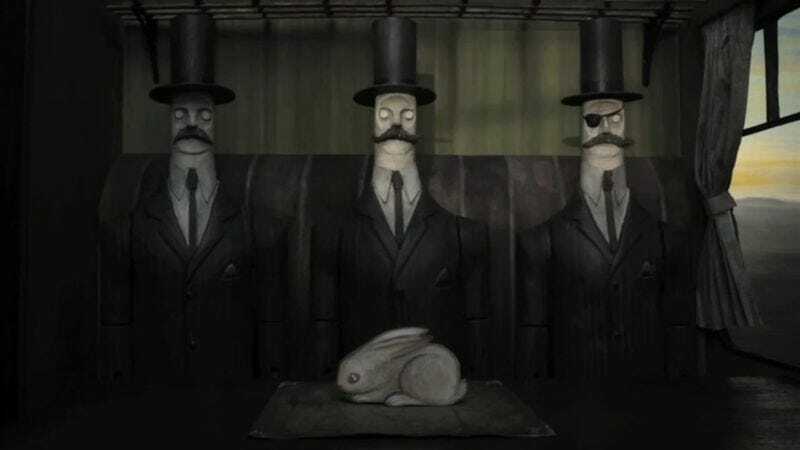 The fanciful stop-motion video for "The Rifle's Spiral" features a traveling magician alone in the desert, who liberates a magical rabbit from three sinister conjurers in matching stovepipe hats. Emmy winner Jamie Caliri directed the clip, claiming influence from the illustrations of Edward Gorey as well as Martin Scorsese’s latest film Hugo. We would also suggest it looks like a Tim Burton-directed version of the Pixar short Presto, in a delightfully dark way.